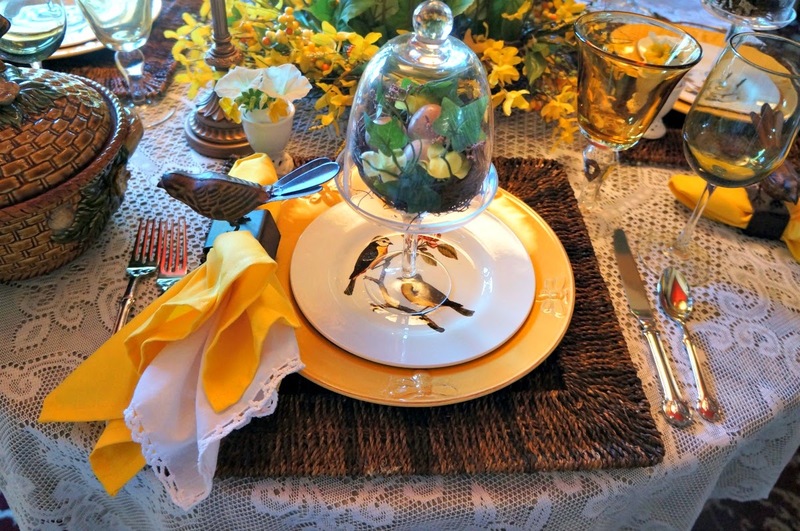 Yellow is such a cheerful color, so I thought I would create a sweet table with forsthia and birdies. I love using wreaths on my tables, as a backdrop for candles, vases or an birdcage. They look great with a charger plate and candles. I adore the little bid cage I bought at Ross. 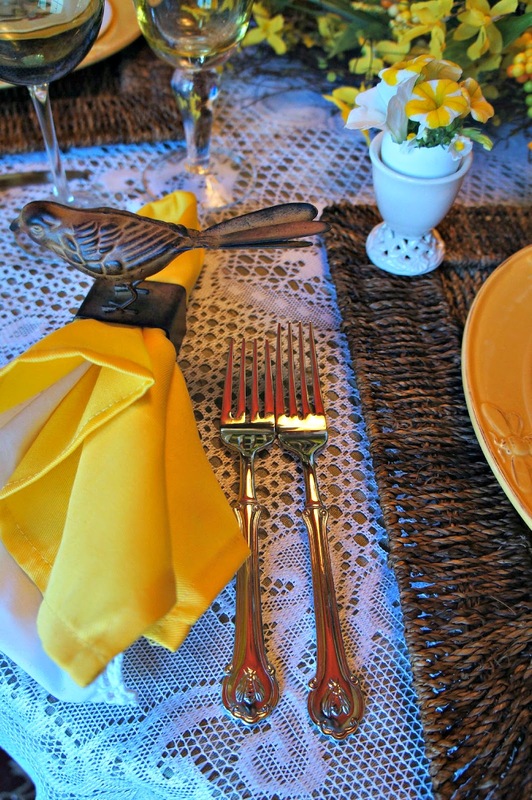 The bird napkin holders are from ZGallerie, along with the Bee flatware from Horchow. If you are in need of coupon for Horchow, visit The Raw Feed. I used it already, so it works. They also have other vendors. 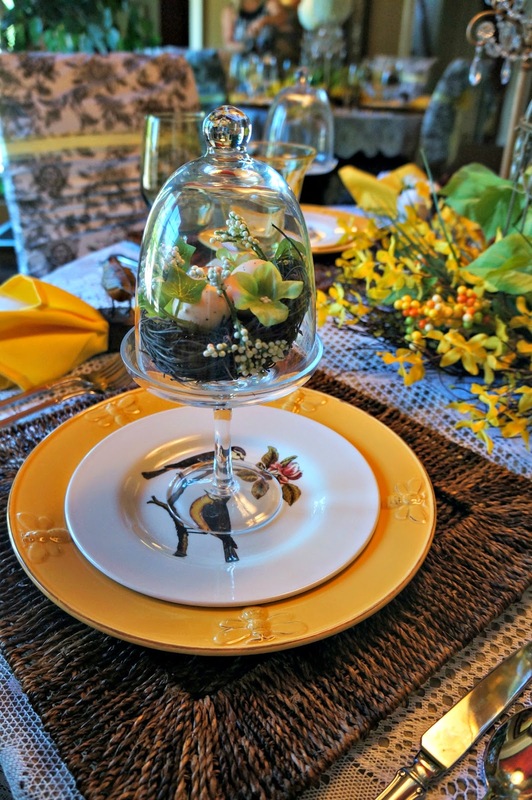 I used my individual cloches on each place setting, with a small bird's nest under the dome. The bird plates I found at Home Goods. The Bee plates are from Horchow. I love these twig chargers. I believe I bought them from Pottery Barn. 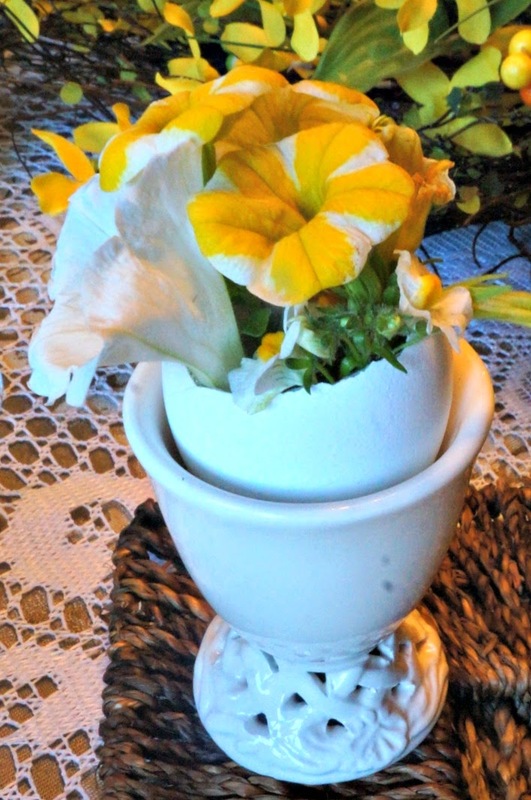 Using cute little egg cups, I added an egg shell with flowers. This cute bird covered dish I found at Tuesday Mornings, fits in perfectly with the bird theme. 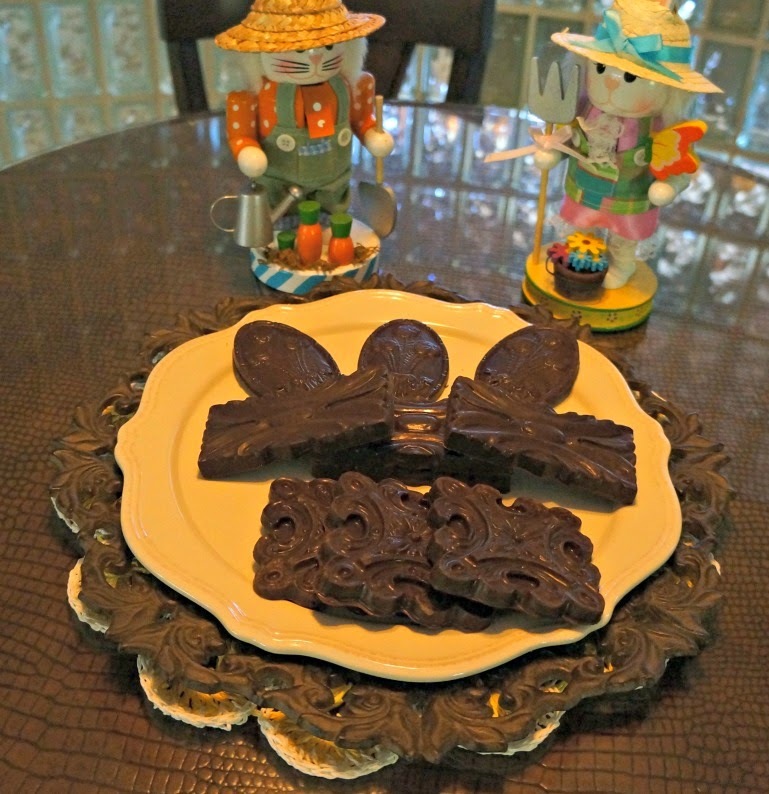 Here's some dark chocolate I created using decorative molds. The darling little bunnies are from a girlfriend for my birthday. Aw this is so cute Linda! Love everything and the way it looks in the mirror...amazing! Quite beautiful snd such attention to detail, Linda. What a lovely setting in which to celebrate good food and friendships. 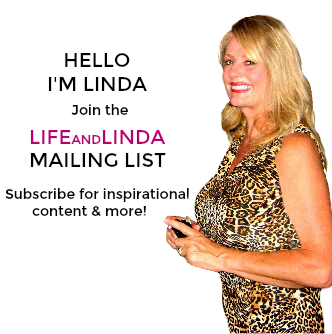 You amaze me Linda! 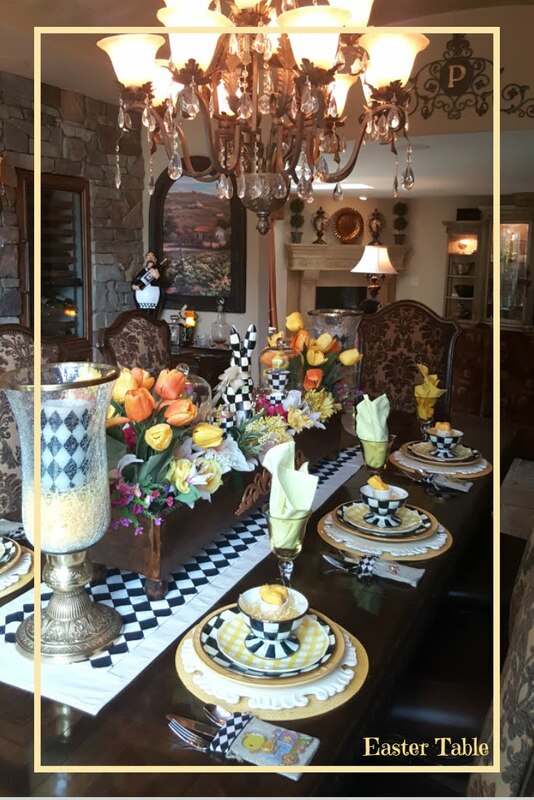 The table is beautiful...so full of life and fun. Happy Easter!!! After we got off the phone yesterday, I realized that we talked so long that you might not have good light for your photos but they turned out perfectly! lol. I will take the blame, Linda - talking to you is so good for the soul! This is so special. I have such love for birds and you've created such a charming setting that I would never want to leave. Love the little eggs with the flowers and the cloches are so perfect! Will you have Easter breakfast here? It would be perfect! Simply gorgeous Linda! 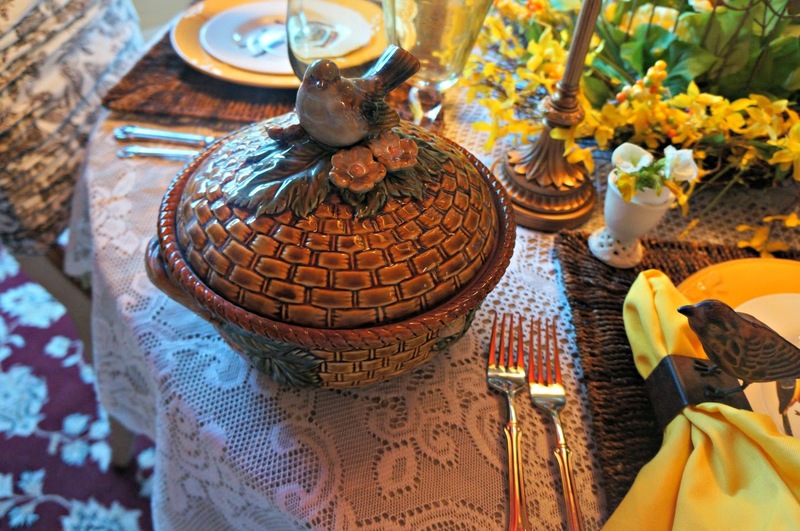 I love the yellow dishes with the Little cloches with nests on top! 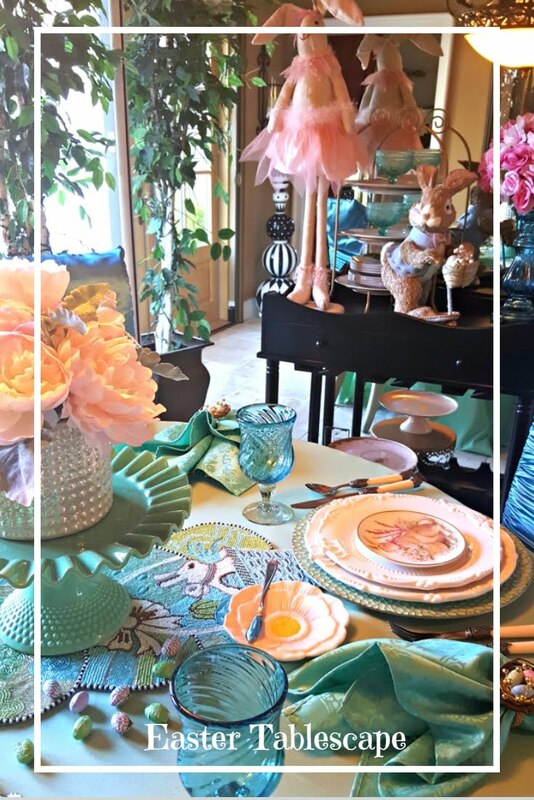 Every element you've used to stage this beautiful Easter table is just perfect! 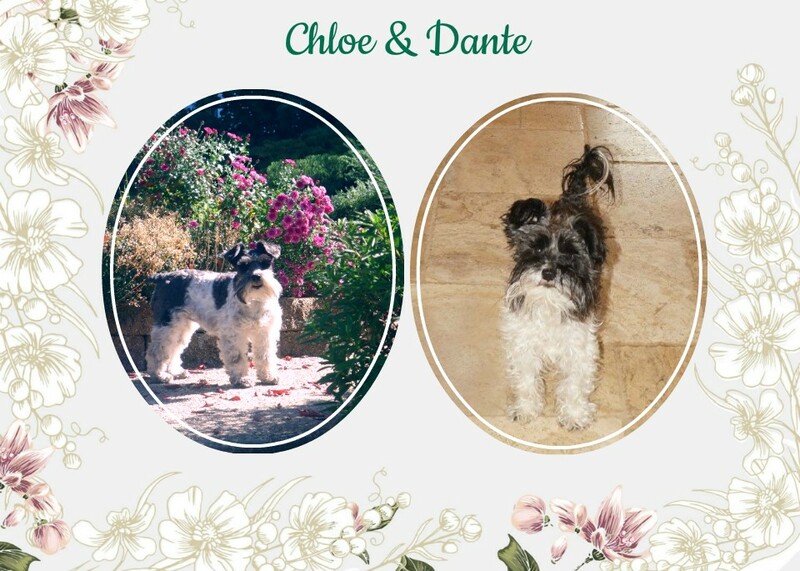 Wishing you and yours a lovely Easter. That's one of the prettiest tables, dear Linda! 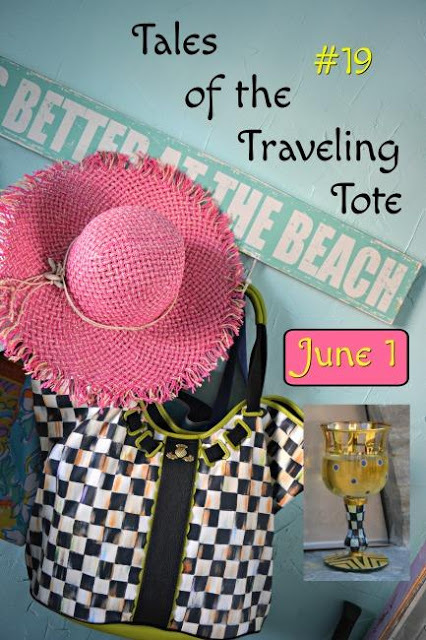 I love everything about it and you're so good about putting everything together and sharing where you've bought it all. I have long admired the Napoleon flatware. 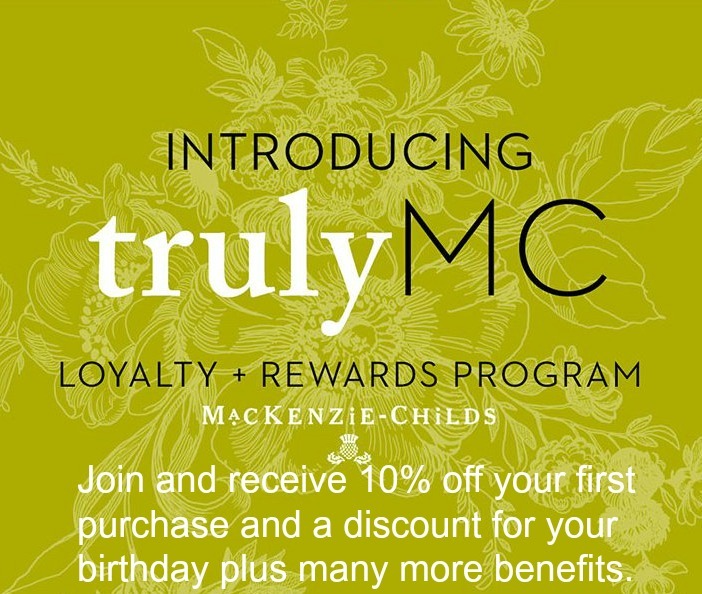 I will check out the coupon. Stunning table Linda, just stunning! 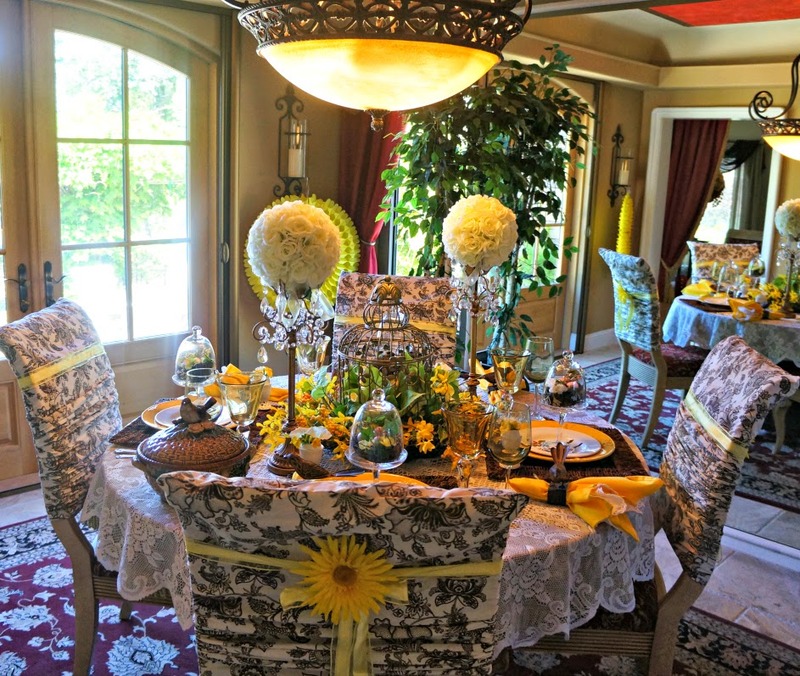 Love the entire color scheme of the black and white chair covers with gorgeous pops of yellow and the cloches with birds inside....I PIN'd it. This looks lovely, Linda! It would have fit in perfectly with the Bird table challenge I did that week! Hope you had a blessed Easter. You are in my prayers. Now that is a beautiful and whimsical table. I love the bird nest under dome and the bee plates. The flowers in eggs are adorable! Delightful table. Your little egg cups look so pretty with flowers in egg shells. 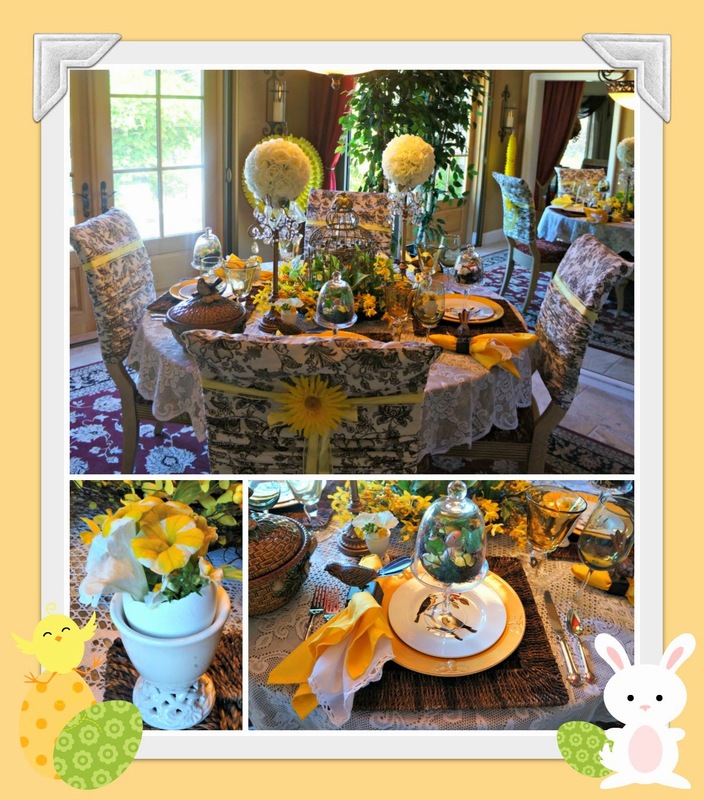 Yellow is such a cheerful color for Easter and you have so many creative features with birds and bee theme. Have a great week. Easter will be here before we know it. Gorgeous table! Would love to sit there and just enjoy some of that delicious looking chocolate! I really like those bird plates and the flatware. 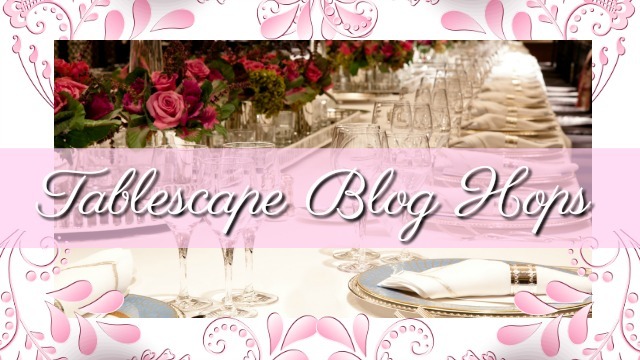 Great idea to put the wreath around the birdcage - so pretty. 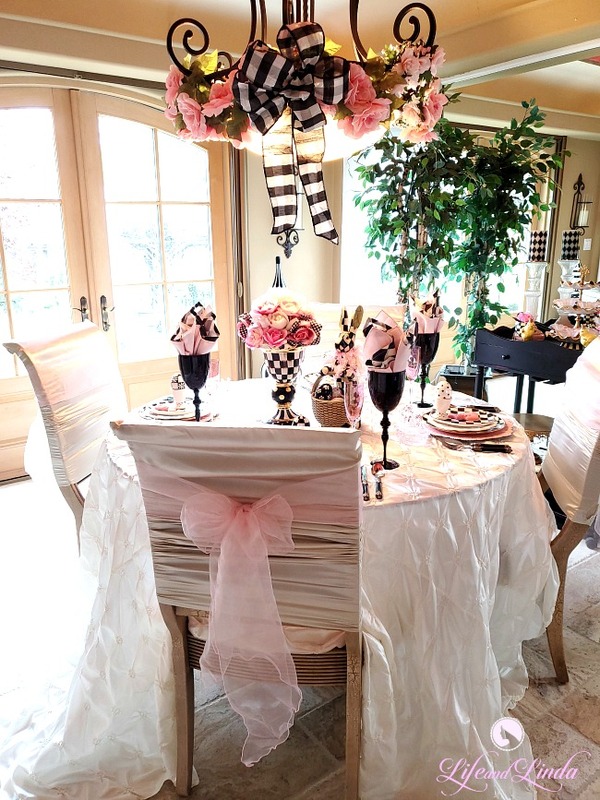 The added décor on the chairs is the icing on the cake.